Damaris Hall’s African roots inspire the swirl of flavors infused in the frozen meals from Global Village Cuisine. The Vermont company offers choices like Swahili Curry Chicken, cooked with coconut milk and lime juice, and an earthy Kenyan Mung Bean Stew slowly simmered with turmeric, tomato, and cilantro. 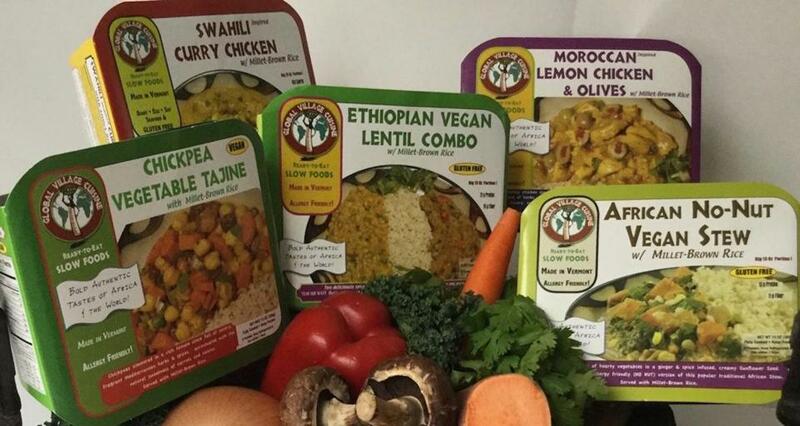 The Ethiopian Vegan Lentil Combo has two lentil stews combined with brown rice and millet; one is laced with fenugreek, the other with cardamom ($5.79 to $6.79 for 13 ounces). “I grew up with these foods and the recipes are the ones my mother taught me,” says Damaris, who started the business with her husband, Mel. Two selections overlap Mediterranean flavors — Chickpea Vegetable Tajine, simmered in tomato stock and sweetened with carrots and raisins, and Moroccan Lemon Chicken & Olives with garlic and parsley and tangy from preserved lemon. All the entrees are gluten and allergen-free. The couple met in Kenya, where she was raised, while Mel, from Memphis, was working on a project there as a student at Dartmouth College. They settled in Vermont because the state was known for its local food movement. “We want to expose people to Africa’s culinary treasures because the variety of spices are so diverse and the food is healthy,” says Mel. They first opened a restaurant, and when it closed, they started the frozen food company. When time is short and you need to get dinner on the table, it’s great to have some ready-made, hearty meals waiting in the freezer — even better if they help the kids acquire some new tastes. Available at Allandale Farm, 259 Allandale Road, Brookline, 617-524-1531 and Whole Foods Market locations, or for shipping go to www.globalvillagecuisine.com.